Meatloaf is a favorite of ours, and it’s so easy to make, we wonder why we don’t enjoy it more often. We were inspired by the high quality ground beef that we purchased from Joy Dolcini — a 4th generation cattle rancher in Sonoma County. We were surprised at their affordable pricing, and happy to go “in” on the purchase with two other families. Knowing where and how our beef is raised has made a big difference in our choice to eat beef. Grass-fed beef is much healthier than the corn-fed beef raised by the large, corporate cattle lots, because it is lower in saturated fat and higher in omega-3 fats. After all, cows are naturally meant to eat grass, not corn. Healthier cows, make healthier beef. It’s been a cold, December day. Gray and chilly. We brightened at the sight and smell of tonight’s meatloaf and mashed potatoes, and left the dinner table warmed and nourished. Preheat oven to 375℉. In a large mixing bowl, lightly beat the eggs. Add the rest of the ingredients to the bowl and mix, folding in the ingredients with both hands until completely combined. Place meatloaf mixture into bread pan (8.5 x 4.5 x 2.5) and bake for 40 minutes. 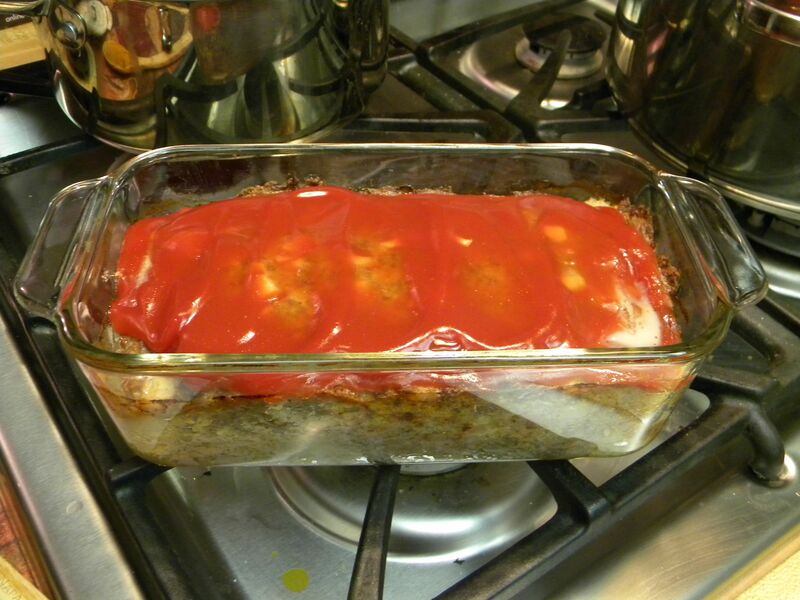 During the last 5 minutes, spread ketchup to cover the top and finish baking. Let cool 5 minutes. Cut thick slices and serve with mashed red potatoes. Leftovers are great for meatloaf sandwiches! Place 4 to 6 slices of wheat bread directly on middle rack in a 200° oven for 20 minutes (or so) until dry but not browning. Let the bread cool on the rack. Using a food processor: First break up dried slices of bread then place into processor and pulse until bread crumbs form. Add seasonings to the crumbs in the food processor: about one teaspoon each of salt and pepper and two teaspoons of dried oregano, and pulse briefly to mix.